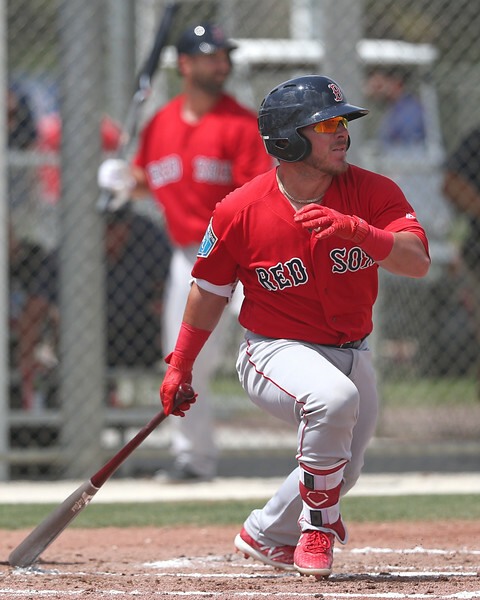 4/12 Cup of Coffee: The Red Sox minor league system finished just 1-3 on the day, despite some a pair of three-RBI performances from Bobby Dalbec and Esteban Quiroz (pictured). Roniel Raudes pitched well in just 4 1/3 innings, while Kutter Crawford was able to strike out eight batters in just five innings. Pawtucket was leading 6-5 after five innings, but an eight-run sixth saw Buffalo take over and win the teams' three-game set. Rusney Castillo, Anuery Tavarez, Michael Ohlman and Jantzen Witte each had two RBI, with Witte's coming in the form of a two-run home run in the fourth inning, which gave the Red Sox their 6-5 advantage. Brandon Workman failed to record an out despite facing six batters to begin the sixth, as four reached on hits and two got on via the walk. All six of them ended up scoring. He relieved Chandler Shepherd, who did not fare much better. He allowed five runs in five innings of work, all of which came on three home runs. Kyle Martin allowed a run and a walk in two shutout innings. Portland continued their cold streak to start the year as they lost their fifth game in six tries, despite a pair of hits from each of the top three in the order in Cole Sturgeon, Danny Mars and Esteban Quiroz. Sturgeon hit a solo home run, while Quiroz chipped in with a pair of homers for three RBI. The production from the rest of the lineup was lacking, generating just one hit. Teddy Stankiewicz allowed seven runs on 10 hits in 4 1/3 innings and Yankory Pimentel gave up four more in 2 2/3 innings of work on two home runs. Salem won their fourth game straight as the top of the lineup had strong performances, headlined by Bobby Dalbec, who was 2 for 4 with three RBI. Chris Madera, Brett Netzer and Jerry Downs each had multi-hit outings as well. Roniel Raudes allowed one run on three hits in 4 1/3 innings. He did walk three batters but struck out six. Algenis Martinez allowed just three hits and struck out four batters in three shutout innings for the save. Downs' RBI single in the fifth was the go-ahead run. The Drive have now lost five straight after a 2-0 start. Michael Osinski hit a grand slam in the sixth to give his team a 6-1 lead as part of a five-run inning, but Lexington responded with a five-run frame of their own in the seventh to re-tie proceedings before they put it away with three runs in the eighth. Kutter Crawford struck out eight in his five one-run innings, allowing just three singles. Brendan Nail pitched 1 2/3 innings, allowing five unearned runs on three hits, falling victim to Greenville's four errors. Player of the Night: Esteban Quiroz did his best to try and spark the Sea Dogs' lineup, hitting two home runs, but after him, no one else was able to follow it up with any sort of offensive production. Quiroz was a mid-season all-star in the Mexican League last season and is playing his first season in the United States in his age-26 season.